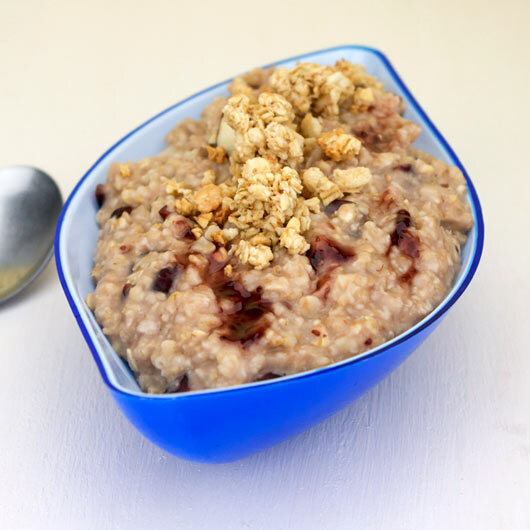 This oatmeal is loaded with cherry and vanilla flavor. It's gets a cherry infusion 3 ways: dried cherries, cherry jam and almond extract (which often tastes more like cherries than almonds.) I like my oatmeal a little on the thicker side. 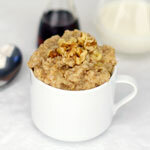 If you like it a little more soupy, reduce the amount of oats to 1 cup. I opted to top my servings with crunchy almond granola so I'd get a nice differential in texture. I've also had this with a few slivered almonds on top and that was great too. 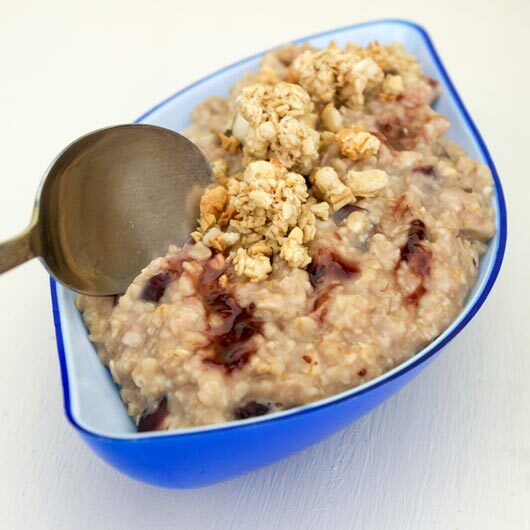 Combine the milk, water, oats, cherries, brown sugar and salt together in a medium sauce pan. Stir and bring to a boil. Reduce the heat to a simmer and cook for 1 more minute. Remove the oatmeal from the heat. Stir in the flavor extracts and cherry jam. Divide among two serving dishes. Garnish each serving with slivered almonds or crunchy almond granola. If desired, splash a little milk over each serving. 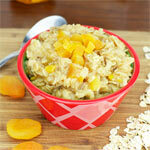 Note: You can make this with Old Fashioned oats instead of the quick cooking kind. Just increase the simmer time to about 5 minutes. 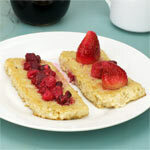 Nutritious, delicious and easy to make. 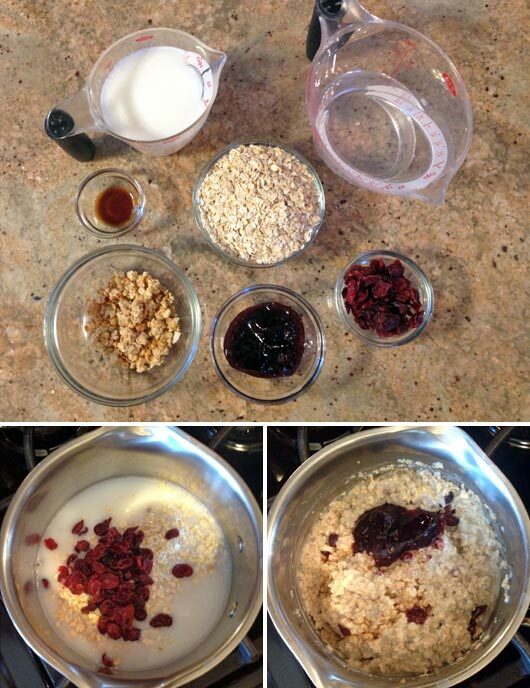 Homemade oatmeal in less than 10 minutes. 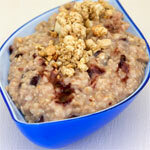 What do you think of Cherry Vanilla Oatmeal? Can you substitute almond milk for regular milk? This even got an Awesome from hubby who previously did not like oatmeal. I was a little concerned that there was no sugar in it or honey or syrup, but it was quite fine as is. We do not have dried cherries and fresh ones are outrageously expensive, so I used a dried berry mix with cherry jam. It was out of this world! Definitely goes into the once a month oatmeal rotation. Finally! An oatmeal that my 6 year old will eat (and enjoy). We also made a blueberry version with bb jam and fresh blueberries.... now THAT was her favorite! 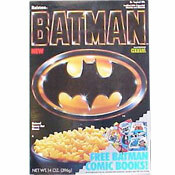 What kid can pass up purple oatmeal? It taste really good with vanilla... a nice cheery breakfast on a cold winter morning. Warm, delicious and slightly sweet. The kids loved it! We loved this with dried cranberries instead of dried cherries. Tip: stir the jam in right before serving and make a twirl pattern with your spoon. Delicious AND beautiful. Thanks for the recipes!